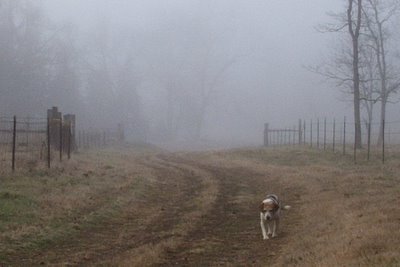 From out of the fog, a little beagle dog. 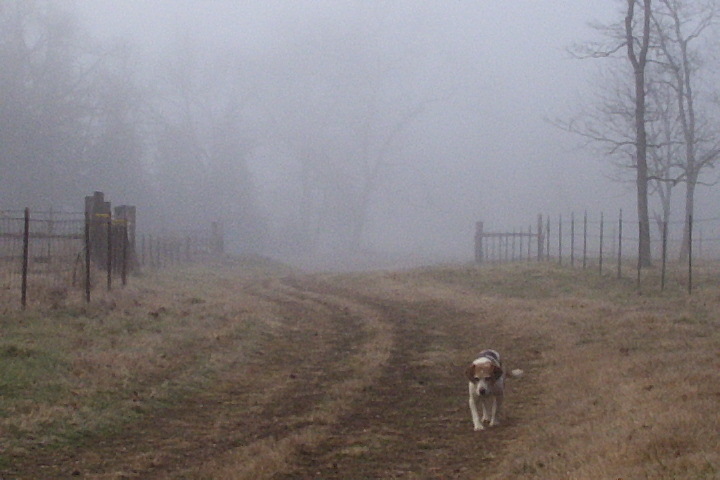 love this image, beagle all hunkered over and trotting to warmth!! Absolutely beautiful, that is my kind of day. What a cutie. I'm more of a cat person than a dog person, but that beagle is very cute. I just love you place, Farmgirl. FG, I have always loved beagles and I love the country so this pic is a keeper for me! Thanks for sharing and keep it up! If you ever do an FG calendar, that photo's a keeper. And why don't you do one, pic and recipe for each month? another country photo..how much I miss fogs. Maybe I should go back to UK... and live in the country once again. I can't resist beagle pics--or the beagle! We've had some really lovely weather--and foggy mornings like these are a neat surprise. She may be small and cute, but she is one tough little dog. And you should hear the bark that comes out of her! P.S. Actually, her nickname is Scarface. Really. Susan, I love coming here to look at your photos! I love this pictures. It looks so crisp and cool and magical. I'm new to this blogasphere world; but by some stroke of luck I stumbled across your site! Love your photos! Looking forward to reading more!! !